Panic and excitement! It’s an odd set of emotions to being feeling at the same point in time, but as we write this that’s what we are feeling. Why? Well, because we bought a food truck. Yep, you heard that right a 24 foot long food truck. One of the questions we constantly get asked is “when we’re going to open up in different areas or parts of LA”. You see frozen treats are amazing, but one thing they are not good at is travelling from, say, our Santa Monica store to Silverlake in the LA heat. It just the physics of things. We would love to be able to open new locations and stores across LA. It is the dream. However, we are a small business and stores cost a lot and take a long time. How can we expand and reach those areas people want us to without opening a store? We thought about doing wholesale tubs to grocery stores, but that didn’t feel quite right yet. What could there be? What could we do? Then just like that rush hour traffic on the 405 gave us the answer. What was that vehicle in front of us. It was a food truck. That got us thinking. Could we do our soft serve on a food truck? This all happened in August. We back and forth on the idea. One minute we were for it the next we weren’t. We mean these trucks are huge. However, we found ourselves constantly coming back to the idea. 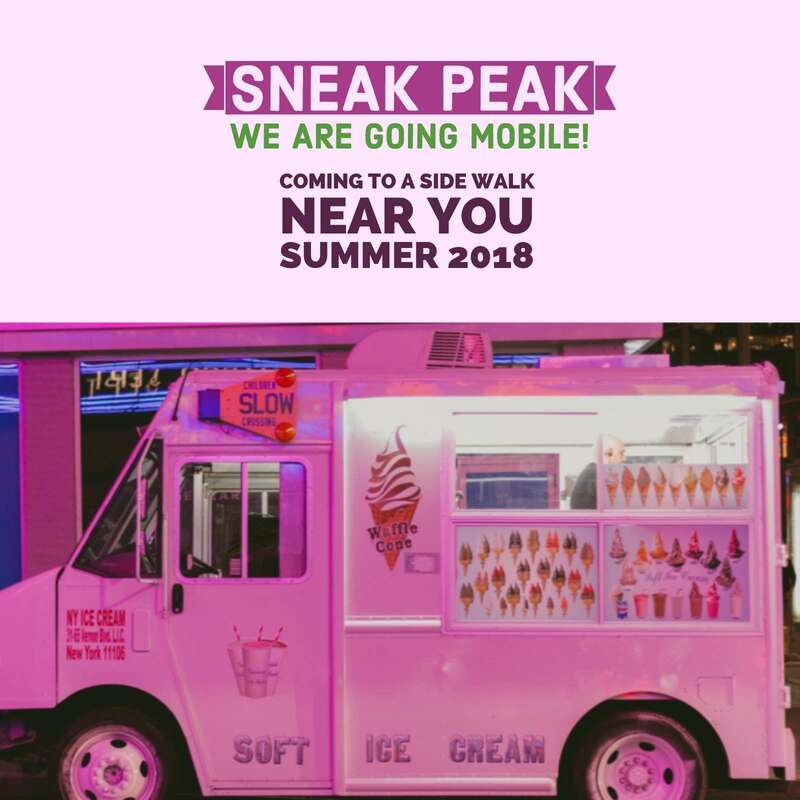 A truck would let us go to different areas, do events and reach people who wanted to try our vegan plant based treats but couldn’t make it all the way to Santa Monica. We started searching for trucks and eventually found what we needed. A previously used soft serve ice cream truck down in Orange County (ironically, it was also orange in color). It needed some work and a little love but had everything we required. By this point we had decided it was impossible to do a soft serve version on the truck. We wanted to have at least 4 flavors. Having that many would mean having a generator the size of an eighteen-wheeler truck engine. The noise would be deafening and being our first truck, we wanted to keep things simple (maybe the next truck). Instead, we decided to do scoop versions of our soft serve. We would start a plant-based vegan ice cream truck…it was a plan and it was starting to come together. There was only one problem. We have never done scoop version of our soft serve. Because our soft serve isn’t ice cream or gelato we would need it to keep in a specific temperature range for scooping. Somewhere between 10 – 20 F.
In life and in business, we believe that sometimes you can overthink things. Just get the momentum going. We had been looking for a truck for the last month and saw nothing as good as we had found in Orange County. It would be sold fast. So we moved on it and at the end of October 2018 we bought our food truck. What has happened since October? Well, we had to redraw fresh plans for the truck. We decided to do this ourselves, so we got our tape measure out and put on our architect hats. The plans were approved by LA County Environment Health in February 2018. Our truck is now in the workshop being finalised. The plan being to launch this Summer. Our we more panicked or excited? After writing this, we suddenly get the sense that our panic has turned into excitement. After all, we just bought a food truck. Woo hoo!